Is “Green Living” getting in the way of the “Green Movement”? 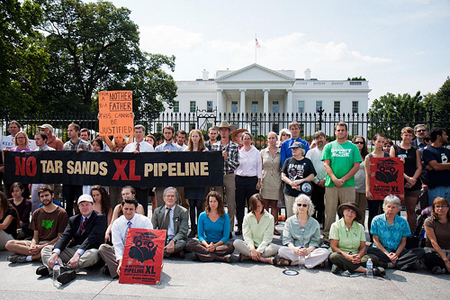 As I hope many of you already know, protests of the Keystone XL Pipeline took place a couple weeks ago in front of the white house. These protests went on for 2 weeks and over 1,200 people were arrested; including Bill McKibben and James Hansen. It is quite possibly the largest act of civil disobedience our country has seen in decades. Not only do I live in the DC area (I’m about an hour away), but I’ve also held a life-long goal of being arrested for a cause I believe in- and this definitely qualified. Yet for two weeks, I heard the news, I thought it would be a good idea to join in, yet I did nothing. Why? Easy- life got in the way. Everything from missing work would be too complicated, to weekends filling up with schedules and errands, it was always easier to do nothing than it was to commit to something. Besides, my house already uses 100% wind power, we drive very little, eat (mostly) vegetarian, grow some of our own food, reduce, reuse, recycle, etc, etc. And what good would come of being arrested, anyway? YOU reduce, reuse and recycle. You turn down plastic and paper. You avoid out-of-season grapes. You do all the right things. Just know that it won’t save the tuna, protect the rain forest or stop global warming. The changes necessary are so large and profound that they are beyond the reach of individual action. So why bother recycling or riding your bike to the store? Because we all want to do something, anything. Call it “action bias.” But, sadly, individual action does not work. It distracts us from the need for collective action, and it doesn’t add up to enough. If I already buy organic carrots and drive a Prius, why should I bother going to the anti-tar sands protest too? I mean, I totally have a dinner party already planned for that day. And, in making us feel good, [they reduce] our personal imperative to enact meaningful change. So, greenists, what is your take on the issue? Do the little, individual actions add up to inspiring the larger, collective actions? Or do they leave you so worn out by sweating the small stuff that you’re too exhausted to take on the big challenges when they come around? Although I have no plans to give up my local milk delivery, CSA, wind power, recycling, or programmable thermostat; I will be doubling my effort to contact my senators and congressmen to enact meaningful change. And the next time a protest like the Keystone Pipeline comes to DC, I’m definitely going to plant myself on that line- who knows, that chance for collective action may come sooner than you think, Moving Planet’s Day of Action is less than two weeks away. I’m big on writing to my elected officials but I feel that does a whole bunch of nothing. I’m also a big “Letter to the Editor” which, in my opinion, is a little better than writing to my senators, et al. Previously I’ve shied away from getting arrested because I worked as an EMT and most companies won’t hire you if you have a criminal record. Because EMS tends to be on the Conservative side, it was unlikely of me getting a job if I had a bunch of civil arrests for protesting wars, pipelines, logging etc. Now that I don’t work in EMS getting arrested is something I plan on doing once Wolf and I are in a financial position to afford bail. And when that happens, I’ll bail you out. I agree that big actions often are the ones that lead to big results. Sure, small actions don’t add up to big results, at least not quickly, but they’re still important and still have some sort of impact, so no one should be discouraged when it comes to recycling or buying locally or supporting green practices with our money. Those actions help the Earth and, as they become more popular, can grab the attention of people who can do bigger things, like businesses. That said, no one should think that by doing lots of little things they’re having a major impact on the environment. Big actions are very important, so if you CAN do them, great. But not everyone can, so do what you can. I think the little things definitely add up. Maybe it’s because I was just looking at motivational posters but I believe it’s true that alone we are a drop but together we are an ocean. If I stopped my small steps and you did and everyone did, they would add up to big bads. Let’s do what we can when we can. If you can’t get arrested for your cause today, maybe you can next month. Yesterday I made the Seat Belt argument about this very notion on Courtney’s post. I think the same thing applies here. Taking tiny steps in the right direction, probably won’t have any affect for 3 or 4 generations. In my house, we drive nothing but hybrids, but when I’m driving down the road behind the gas guzzlers, which are spewing raw white smoke out of their exhaust system, I don’t believe for a moment that my tiny efforts matter at all. Of course, the corporate interests aligned against us on the Tar Sands pipeline are so powerful and own so many congressmen there really isn’t any activity that can be done to stop them. Getting arrested just gives them ammo to make sure you never get another job again in your life. Corporations have affectively ended any sort of meaningful protest of their activities no matter how criminal or dangerous. The environmental movement, and actually most social justice type movements are going to have to come up with a new way to implement social change if they want it. The old ways are doomed to failure, corporations hold all the cards. But that’s decades a cynicism and experience talking, no hopefulness. I don’t know Jody, the ACLU keeps track of these things pretty closely. These days, the cops decide that your protesting is dangerous to their radical right wing ideology and you end up on a terrorist watch list. I know they’ve done that to several death penalty advocates in my state. Here’s a link to the bigger cases they have right now. In the states that they don’t have reported instances, I suspect that’s because of the violent nature of the police forces there not allowing something like that to be reported to the ACLU. The problem is that being labeled as an enemy of the state and then all those databases get fed together and you are basically sanctioned without means of defending yourself or your actions. I’m sure if you dug deeply enough that affects everything from your credit scores to your ability to get your kid into college. American’s have the right to protest, but they don’t have the right to protect themselves from the corporations that choose to punish them for exercising those rights. Corporations are now super Citizens endowed with rights beyond our imagination, including to deny services to anyone that doesn’t meeting their ideological litmus test. And the vast number of police spies that joined these organizations to expose their membership ranks and to act as agitators for behaviors that will lead to more arrests. 10 years ago I would have said exactly what you are saying now. But now, I can’t imagine believing that anymore. Jamison- you are correct, you can be labeled, harassed, spied upon, and stereotyped against for your views and actions by the police or government, but most of what you listed is not necessarily the same thing as a criminal record- although they can be related. ACLU also tracks the most extreme cases, and like I said, I was speaking in general terms… each state and situation is different and being arrested is not something to be taken lightly- it’s just not as cut and dry as being arrested at a protest suddenly equals a criminal record with no job prospects. Interesting post! For me it is easier and ‘safer’ to focus on green living. I have been thinking about going to the Tar Sands sit in in Ottawa but I’m hesitant because of the high risk of arrest that is being talked about with the event. And if I had done this 5 years ago prior to starting the job I currently have I would never had gotten hired because of an arrest like that. So I guess I am just hyper aware of that. I’ve never really wanted to get arrested, but I’d like to have to run from the cops at least once in my life. I’m fast. And wiley. One of the points that I think you’re making is that life gets in the way. It’s not “green living,” it’s just life. It’s easy to make excuses — any excuses — for why we don’t want to go to a rally or a protest or a sit-in. So I’m going to respectfully disagree with the writer of that op-ed and say that positioning “green living” against “the green movement” feels like a way to diminish our individual actions and sounds like a reason for the writer not to do any green actions at all. It was reading about other people’s little, everyday actions that caused me to rethink my own and change my lifestyle. And even if most of us just do the little actions, someone is going to come along, see all our personal changes, learn more about them, and decide that maybe they do want to lobby to save the tuna or protect the rainforest. That being said, there is more to the green movement than sweeping policy changes. We have to think about social changes too, like reducing what we consume in order to use less resources. No one can mandate that kind of social change. It’ll take more and more of us who are reducing consumption to make it look normal and get other people involved, which in turn becomes a kind of meaningful change in an of itself. I call foul on this whole debate. Would You Use “Family Cloth?” Would You Support a Grocery Bag Surcharge? How Can We Recycle Old Cassette Tapes? The Carnivore’s Dilemma Is Big Green Bad?